NinjaBee Games: Sugar, Spice and Not So Nice Now Available! Good news everyone! Remember that contest we held oh so many months ago, where you voted which would be the next kingdom we added as DLC to A World of Keflings? Well, you chose, we made it and now, IT's HERE! 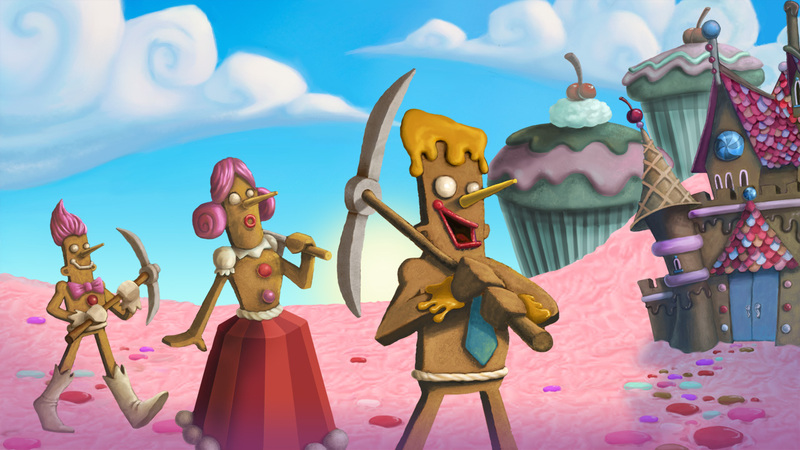 Sugar, Spice and Not So Nice, also known as the Candy Kingdom DLC for A World of Keflings released today on Xbox Live Arcade! So what are you waiting for? There's a cotton candy forest to harvest, gingerbread Kefling houses to build, a bakery to run, an evil wizard to thwart, an amnesia-fied unicorn to un-amnesiate, a gaggle of gingerbread Keflings to build a city for and so, so much more! You can download it now! Click on the link below to go to the Xbox Live marketplace and add Sugar, Spice and Not So Nice to your Xbox's download queue now! Thanks for this DLC! My wife loved it... she's a vivid Keflings-fan!